Color is an absolute powerhouse when it comes to print marketing. Whether you realize it or not, your company’s logos, branding and other promotional printing efforts rely on color as an asset to your messaging and designs. 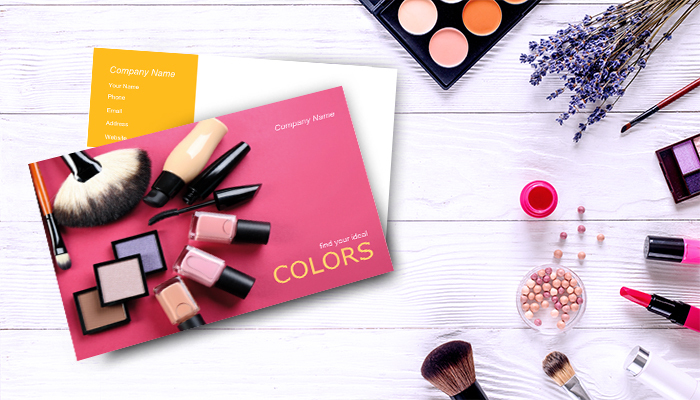 Once you realize that effective color schemes are a necessity in your printing efforts, you’ll want to focus on choosing colors that support your brand’s “personality,” in order to bring in the right consumers to your business. 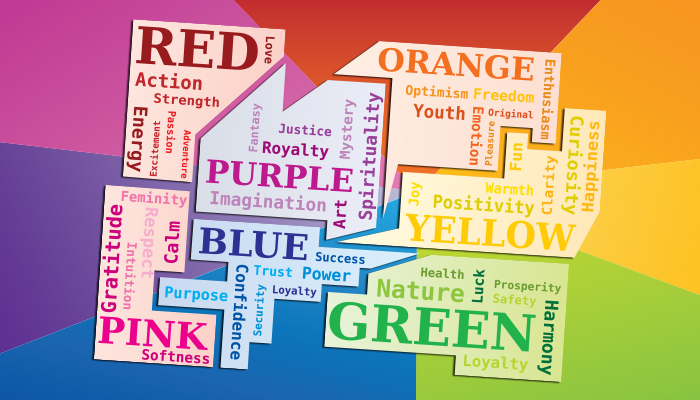 Your branding will be much more powerful by harnessing the right colors. But with so many colors to choose from, how do you know which colors are right for your designs, let alone how much of it you should use? First, be aware of the fact that colors are a prominent trigger to a consumer’s brain in a multitude of ways. 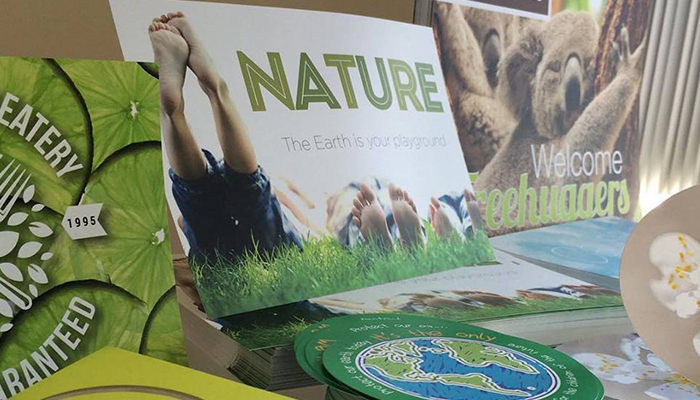 According to psychologists, 87% of our sensory perceptions comes from colors.1 For example, a flyer with a lot of Green and Brown tones might be eye-catching to someone who is environmentally conscious because they immediately think of the environment due to Green and Brown’s association to nature. 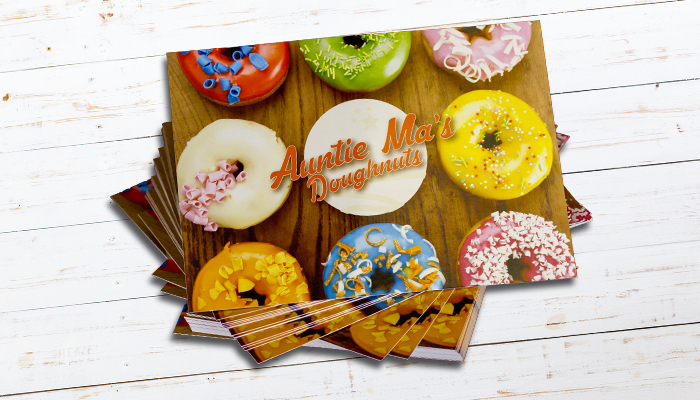 While colors in your print materials are essential, be vigilant about not overdoing. The key is to choose colors that will enhance your brand’s messaging. Keep in mind that dark on light and light on dark are the easiest to read. It might not be the most creative stance, but it is the most practical when it comes to readability, which is a high priority for those who want to include a call-to-action in their print materials. The following color guide will assist you with which colors will help your print marketing efforts to thrive. This guide not only describes the psychology of each primary color, but which colors compliment which, and which industry it’s best used for. By the end of this guide, you’ll be ready to design an influential print marketing campaign for you and your company. Once you choose your ideal color scheme (by testing out what works best for you) make sure to stay consistent with it to make your company as memorable as can be! Being a color of strength, red evokes aggressiveness and power. It’s a color that commands attention and brings about excitement. Due to its emotional intensity, make sure to use it sparingly or else it may overwhelm potential customer. Red makes a good accent in logos and borders, making it ideal to include to use for headlines, subheads, contact info, and offers due to its loudness and the attention it draws in. It is known to stimulate hunger, drive sales, and make people feel fiery and passionate. Red is very bold and ideal for making a statement, but it tends to overwhelm other colors when used in excess, so using it in smaller doses may be more effective. 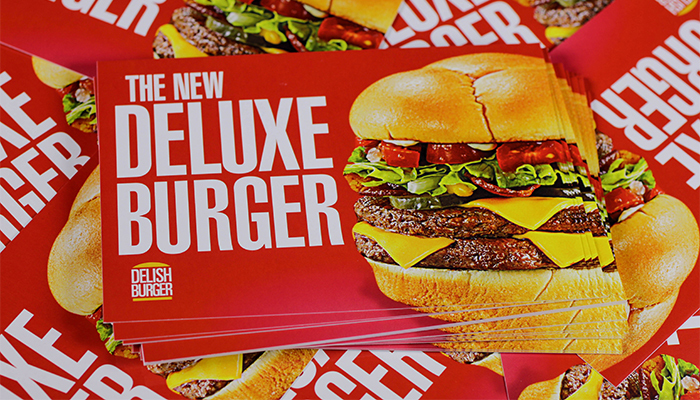 The loud Red background enhances the cheeseburger in the foreground and the simple headline, making it appetizing and inducing hunger. We tend to view Black as an authoritative color. It demands respect because of the traditional association it carries. It’s important to be cautious when using this color because, while it represents sleekness and class, it also is tied to feelings of depression, fear, darkness and drama. That being said, black will hold out strong in business cards, brochures, and any print material that heavily relies on text. It can fit into almost any design and makes other colors stand out. A simple black type on white paper is traditional, practical, and legible. So don’t be afraid to stick to classic standards if your print materials call for it. 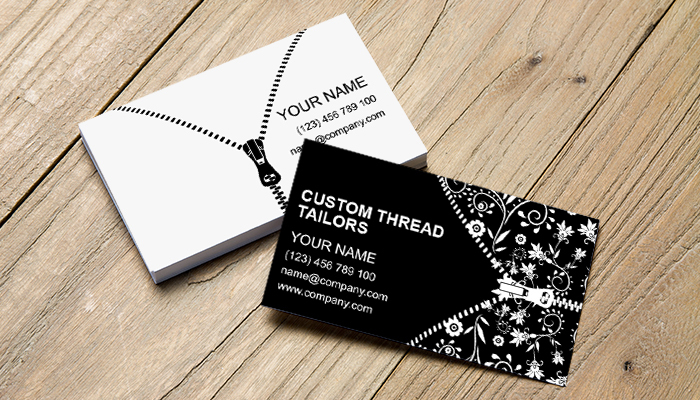 Sophisticated and chic, who wouldn’t trust a tailor that came off sleek and professional thanks to the way the Black background in the business card suggests? Blue psychologically reigns as being calming and intelligent. We can link this color to trust, security and even fiscal responsibility. We trust Blue because it’s the color of everything that is stable and permanent in the world, such as the ocean and the sky. We depend on these elements to always be there for us. However, you should note that blue has negative connotations as well. The expression “feeling blue” is associated with sadness, and our skin alludes to a bluish color when we feel extremely cold. 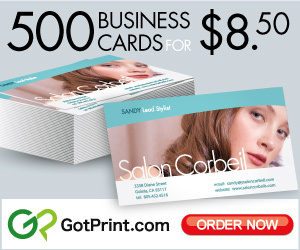 So use it in your print materials accordingly and associate them to your brand appropriately. Furthermore, blue is stamped with a male gender identity, so boys tend to be more pulled toward it. Consider this ideology when you are taking your targeted audience into consideration. A great way to promote protecting the planet is by adding natural Blue hues. Another color that derives from nature is the earth tone of Brown. Because of how dependable and consistent this color is, it can be a feeling of ease and calmness when used in the right context. It’s the color of a lot of things that are natural, like dirt and wood, which makes it reliable due to its earthiness. You may want to consider this if your company is centered around trust, like a law firm or real estate. Aside from its “down-to-earth” feel, it can also be considered sophisticated and strong. 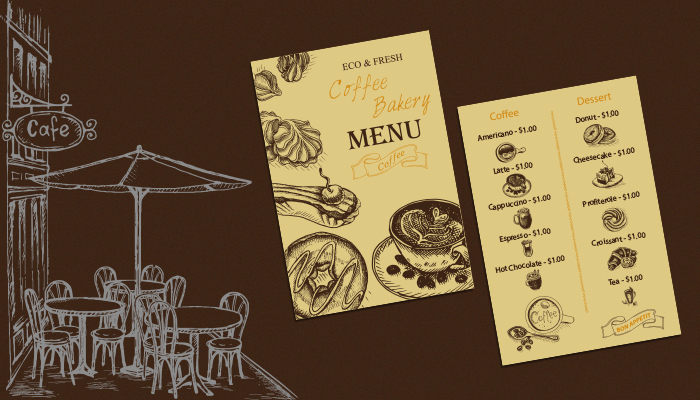 This coffee menu with its Brown undertones radiates a feeling of calmness and earthiness. Trees, grass, and vegetables come in all shades and tones of Green – the reasoning behind why we think of nature and health whenever we see it in advertising. 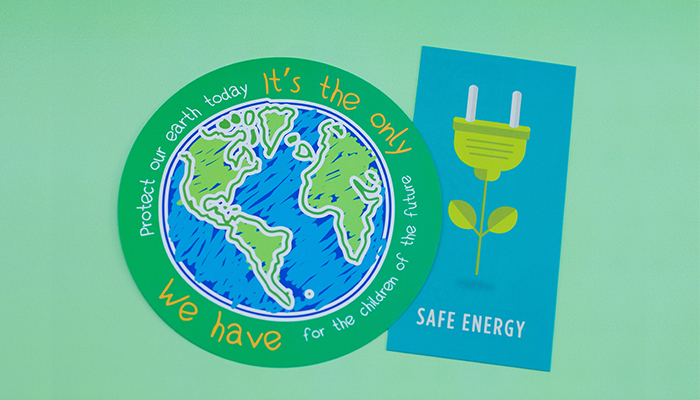 Green is heavily associated with other emotions such as fertility and wealth. It’s considered a relaxing color because it’s easy on the eyes. Because this color goes hand-in-hand with nature, it’s the color that many Eco-friendly and organic companies like to use. However, don’t be afraid to use this color if your brand is not related to nature or health. A darker green correlates with money and trust, so you can amplify your branding when you add in dark green if it has to do with financing, banking or anything fiscal. Green spells out – nature! A warm orange color is known to stimulate your emotions and appetite, giving off a feeling of excitement and confidence. It’s very inviting, making it a great color for any call-to-action type campaign. It gets your brand noticed while remaining subtle, rather than obnoxious. It is also very animated and enthusiastic, which makes it fun and attractive to kids. It is a combination of red and yellow and has a sunny shade to it, making us feel warm and content. The Orange font in the headline is subtle yet inviting. Does thinking of Yellow make you feel warm? Yellow is the color of the sun, which represents warmth and happiness. We can also associate it with energy and friendliness. However, just like the sun, Yellow can be quite overpowering if you use it too much. It does very well as an accent and enhancing it’s complementary color, Purple. Due to its brightness, Yellow is often associated with cheerfulness and youth, so a lot of children’s companies take advantage of it in their branding. Be careful with how bright you choose your shade of yellow when you are designing your materials, if you go too dark it can give off a dirty or unpleasant effect. 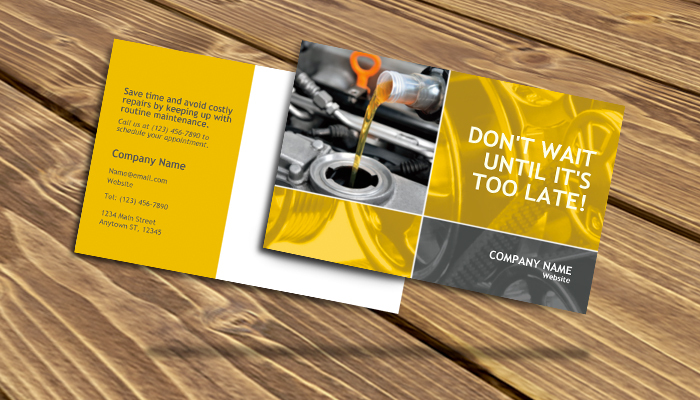 Splash Yellow onto your postcards to add a bit of urgency and excitement. Tradition links purple back to royalty, nobility, and the bourgeois. It’s also known as a symbol for magic and power. It has a certain mystic air to it because it derives from the combination of blue and red. If you want your business to be flashy, pairing it with silver or gold colors can give it that boost of wealth and extravaganza. Because this color is rare in nature, it works better with artistic and creative types. 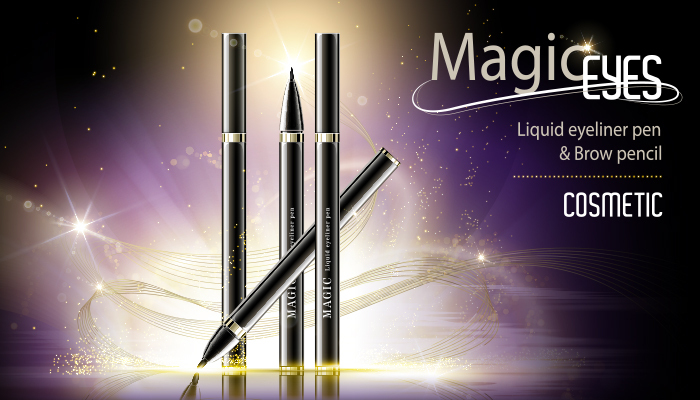 The Purple tones makes this product appear enticing and magical. Pink is a sign of femininity, and we tend to think of “pretty” and gentle things when this color comes to mind. We also associate it with love and romance. It is tender, gentle and caring. The lighter the pink, the more calm it feels. However, the darker the shade is, the louder and more attention grabbing it becomes. Just as Blue is stamped as a sign of the male gender, Pink is stamped as a sign of the female gender. While it’s not always true to every person, it’s still an important ideology to keep in mind when considering your targeted audience. Relate to a feminine audience with shades of Pink. It is sterile and clean which is why you’ll notice most hospitals and doctor’s offices to be white. Most importantly, it’s the perfect complement to any color because it takes away from unnecessary distractions and tones down colors that are loud and intense. 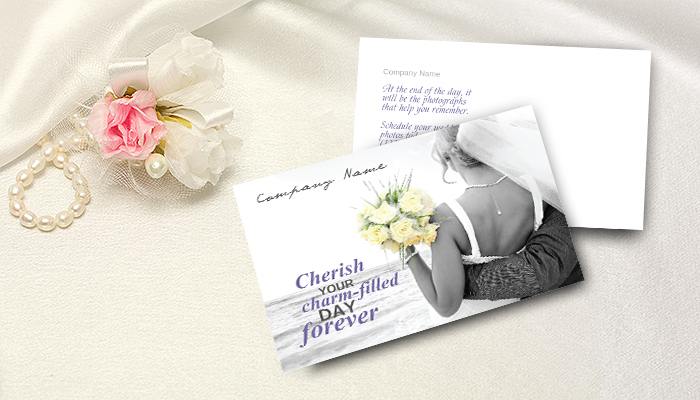 Using a White background for print materials is the traditional go-to route, one you can hardly go wrong with. In Western cultures it’s the standard color for weddings, and in Eastern cultures it is symbolic for death and mourning, so it is important to know the demographic of your targeted audience very well when using this color, as well as any color. Overtones of White may be just what you need to deliver a feeling of newness and purity. Do you write blogs for choosing a business name? Not yet but we will keep this in mind. Thanks! I’m in the real estate industry and my thought is that brown is too dismal for real estate. 14pt vs 16pt vs 100lb – Which Paper Stock is Best For You?